Pete Kaiser with his lead dog Palmer, who helped him to four K300 race victories. If Ron Kaiser had one thing to say to his son, Pete, after a sled dog race, it’s this: Pete could have run a little faster. "During the racing, this conservative style, hanging back, Ron would always be, 'why don’t you go out a little faster," recalled Janet Kaiser. Ron described it as "armchair mushing." Listen to the profile of Pete Kaiser here. Next door to their home is Pete Kaiser's dog-yard, which used to belong to his father. This is a big year for Pete. Besides aiming for his fifth K300 trophy, Pete plans to run two teams in the Iditarod this year. His handler, Niklas Wikstrand, is racing one of his teams. So how did Kaiser get to be one of Alaska’s top mushers? He says that it's "basically a lifestyle." It started before he was born. His father, Ron Kaiser, moved to Bethel in 1979. A year later, Bethel put on the inaugural Kuskokwim 300 race. Ron ran several of the subsequent K300 races, but never won. His best K300 finish was 10th place, but he nourished a fierce love for the sport. When Pete was born, Ron gave up mushing to raise a family. Then he got a dog, Giant, to pull a young Pete around. "One dog, and pretty soon you need two dogs because kids are getting bigger, and so you need three dogs, and then five or six dogs so dad can actually train them to behave, and then, you know, they liked it," said Ron. 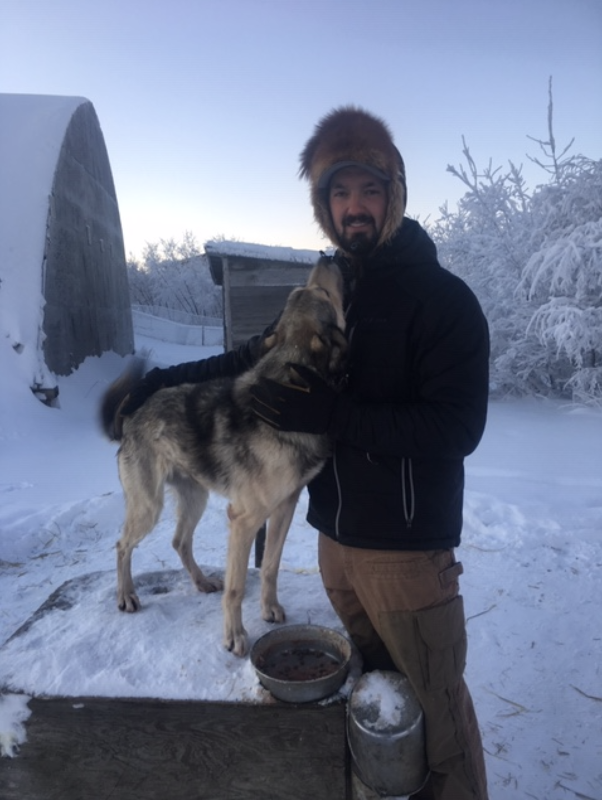 Even though he grew up with sled dogs, Pete didn’t decide to dedicate his life to mushing until college, his father says. "He was sitting up there in Fairbanks saying, ‘I really don’t want to go to school, I want to run dogs.' I was, ‘Okay, might as well come do it then,'” said Ron. Pete started researching everything he could find about mushing. He sought out mentors who showed him how to balance a personal life with a demanding sport. Pete also had a community that backed him. "When I decided to mush full-time and really race and make a go of it, I was fortunate to have a good seasonal job," Pete said. His dad took care of Pete’s dogs in the summer while Pete worked on a barge for Bering Marine Company, a Lynden subsidiary. Pete also lived at home in the beginning. Pete says that the race that made it possible was the K300. When the race started in 1980, the founders just wanted to see if they could keep it going another year. Then another year. But forty years later, Pete Kaiser represents the race’s impact on the Yukon-Kuskokwim Delta. That’s according to Myron Angstman, a K300 founder and two-time race winner. "He’s a local guy who is locally sponsored, for the most part. His helpers are mostly local, and he’s able to compete against and win against the biggest teams in the sport," Angstman said. But can Pete Kaiser keep his mushing career going? It’s a lot of money to keep a small kennel like Pete’s afloat: around $50,000 annually. There’s the freight costs for bringing supplies into the bush, and traveling costs for when Pete has to go to other parts of Alaska to train because of poor conditions in Bethel. "There were a lot of springs being completely broke and starting work again and winning some money, putting it all back into the dog program again. But with some of that racing success comes sponsorships," said Pete, who now has a total of seventeen sponsors. Pete has also sacrificed a lot more than income. He’s only been out of the state four times in the past decade. He’s gone a lot training, and almost everything in his life revolves around the dogs. But as his two young children, Ari and Aylee, mature, he wonders if he’ll still be mushing in another decade. "If I were to get out of dogs right now, it would be just odd not to have a yard full of dogs to go feed every night. It’s just such a routine you get yourself into every morning," Pete said. He still wants to win the Iditarod. And even though he’s pretty low-key about his competitiveness, Pete wants that fifth K300 win and won’t have to go far to see the trophy: Ron has made many of the K300 trophies, of which his son owns four. Pete wants to win it, his parents want him to win it, and that’s what others in Bethel want too. This weekend, all eyes will be watching Pete Kaiser: the one to beat in this 40th K300 race.